Jay Ruskey, left, and Mark Gaskell, shown at a coffee tasting in 2015. They planted their first California coffee field trial in 2002. Coffee is being commercially grown in California and coffee drinkers can't get enough of the locally produced beverage, which currently retails for about $18 per cup. Anyone who is interested in growing, processing or marketing specialty coffee in California is invited to a Coffee Summit on Jan. 18 at Cal Poly Pomona. Until recently, American coffee was grown commercially only in Hawaii. To make the most of their precious water, California farmers have begun experimenting with coffee plantings and producing beans that fetch a premium. At the Coffee Summit, participants will learn about new opportunities for this high-value crop from industry professionals. Summit topics will include development of estate coffee, coffee production, pests and diseases, processing methods and marketing. Coffee is planted from Morro Bay to San Diego, with production concentrated in Santa Barbara, Ventura and San Diego counties, according to Gaskell. 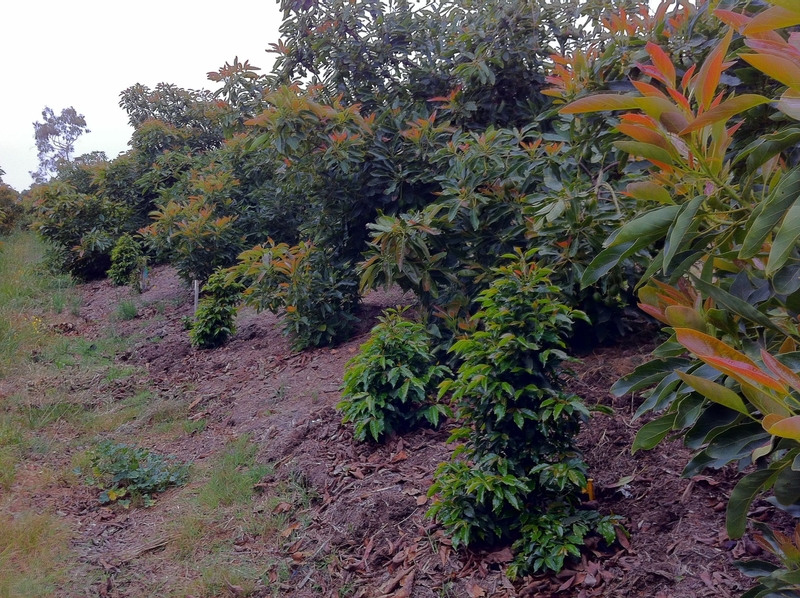 Coffee interplanted with established avocado orchards requires no additional land, water or fertilizer. California coffee industry leaders from Santa Barbara and San Diego counties and agriculture professionals with University of California Cooperative Extension, University of Hawaii and U.S. Department of Agriculture will give presentations and answer questions. 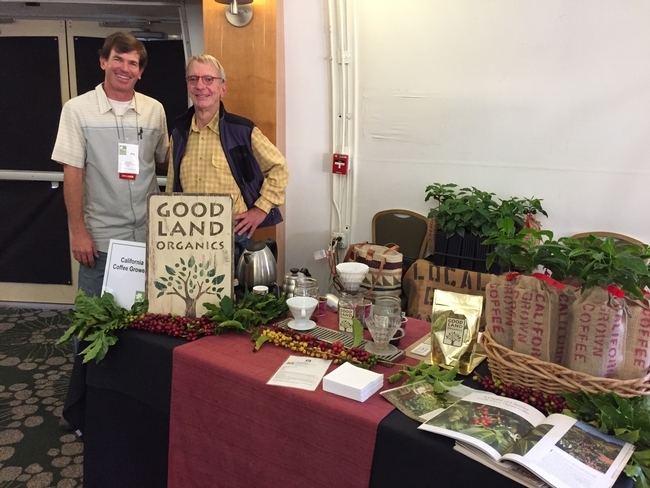 Good Land Organics grower Jay Ruskey, who has been growing coffee in Santa Barbara County since 2002, and Gaskell will discuss growing coffee in California. Based on their coffee variety research trials, UC Cooperative Extension advisors Ramiro Lobo and Gary Bender, both based in San Diego County, and Duncan McKee of Cal Poly Pomona will discuss which varieties are suitable for production in California. “We are working collaboratively with UC Cooperative Extension to determine the best coffee varieties for our area,” said Valerie J. Mellano, Cal Poly Pomona professor and chair of the Plant Science Department. “Much of the California coffee is grown along the more coastal areas, but we are really interested in determining what will do well in the more inland areas, where it is a little hotter in the summer and a little colder in the winter. Andy Mullins of Frinj Coffee, a cooperative of 24 farms including Good Land Organics, will discuss business and marketing opportunities for new California coffee growers. The Inaugural Coffee Summit will be hosted by the Huntley College of Agriculture on Jan. 18, from 8 a.m. to 4 p.m., at the AgriScapes Conference Center at Cal Poly Pomona. Registration is $75 and includes a continental breakfast, lunch and coffee tasting. For more information and registration, visit http://bit.ly/2jtXyFP. Is it possible to get a copy of the proceedings of the conference. I was not able to attend. Thank you for your interest! The Coffee Summit organizers at Cal Poly Pomona are working on gathering the PowerPoint presentations and hope to make them available later this month. We will post a link to them here.